Learn the difference between the political movement of ‘Zionism’ started by Theodor Herzl and how it’s been portrayed to be about the Judaism when it isn’t. The TRUE Torah Jews website gives many resources to help understand the important difference and which explains how the Zionist state of Israel is using Jews for their agenda. The roots of it tie back to the House of the Rothschild’s who bought the land of Palestine in a deal made with Britain called the Balfour Declaration where the “Rothschild Zionists” promised to bring the U.S. into World War 1 if the Brittish would give them the land. Do “Ashkenazi” Jews have a right to Palestine? 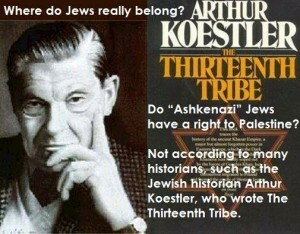 Not according to many historians, such as the Jewish historian Arthur Koestler, who wrote The Thirteenth Tribe. The word “Jew” refers to both a religion and a race. Using one word for two different concepts is as stupid as referring to a religion as “Chinese”. DNA research confirms that 97% of “Jews” are NOT descendants of Abraham. “Christians should not support the Zionist State of Israel” because it is not according to what God said in the Torah and it is nothing more than a political movement that has infiltrated the Old Testament. What, then, are modern Jews? Modern Jews are people who choose to think of themselves as descendants of Israel. Most modern Jews are not semites, but are descended form Eastern European tribes that converted to Judaism in the middle ages. Arthur Koestler’s ‘The Thirteenth Tribe’ provides much information about this. Modern Jews do not worship the God of the Old Testament. They are either secular humanists, or else Talmudists, and the Talmud has no more relation to the Old Testament than does the Quran or the Book of Mormon.